Other Ingredients: dibasic calcium phosphate, microcrystalline cellulose, stearic acid, hydroxypropyl cellulose, modified cellulose gum, and colloidal silicon dioxide. Suggested Use: 1 to 5 tablets daily with meals. Ascorbyl Palmitate overcomes the futility of Vitamin C supplements. Ascorbyl palmitate (AP) is a long-lasting form of Vitamin C. Unlike regular vitamin C (ascorbic acid), the majority of which gets flushed from the body in just half an hour, AP remains in place for days. The palmitate portion of the AP molecule penetrates the membranes of cells and stays there, anchoring the ascorbyl portion just outside the cell membrane, where its antioxidant action is most needed. Ordinary Vitamin C molecules, on the other hand, drift around in the watery regions of the body, only occasionally bumping into a cell membrane and doing what we want them to do: protecting the membranes from free radical damage. suppresses cancer tumor actions — 91% suppression in mouse experiments. The bioavailability of AP is low, but may be increased by reducing the acidity of the stomach by means of antacids or acid-suppressing drugs. Ascorbyl palmitate (AP) is a fat-soluble form of Vitamin C. Its antioxidant activity is the same as that of ordinary (water-soluble) Vitamin C, but AP is far more persistent. The palmitate portion of the AP molecule penetrates the membranes of cells and stays there, anchoring the ascorbyl portion just outside the cell membrane, where its antioxidant activities are most needed. Ordinary Vitamin C molecules, on the other hand, drift around in the watery regions of the body, only occasionally bumping into a cell membrane and doing what we want them to do: quenching free radicals. Medical research indicates that AP stimulates collagen production in skin and other tissues, and that it penetrates into nervous tissue where it protects against free radical damage. 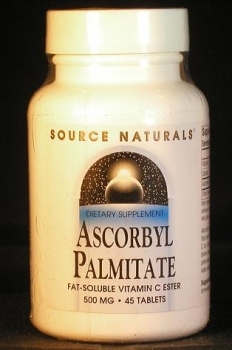 Because of its excellent skin penetration and its ability to induce collagen production, ascorbyl palmitate is frequently used in topical formulations of Vitamin C. Studies have shown that it is an effective anti-inflammatory in cases of psoriasis and sunburn, and that it causes skin to become thicker, softer, more resilient, even-toned, and less wrinkled. Both topical and oral formulations have shown powerful anti-tumor actions — 91% suppression in mouse experiments.